Have you registered your Glo SIM? Did your Glo line refuse to make call for no reason known to you? Did you buy and register your Glo line newly? OR have you been using your Glo line since you bought it without knowing the status of the line since it is active? You can simply solve the issues above through checking of your Glo Registration STATUS. 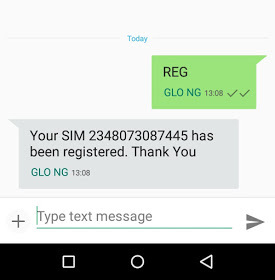 This will enable you know whether your Sim is registered with Glo Network or not. So to know and be on save side whether your Glo line is registered or not, read on. "Your SIM 080713xxxxxx has been registered. Thank You"
Got any contribution for this post, kindly use the comment box to express. Thank you.